For premium guidance on the supply, repair and replacement of door springs, residents of Newton, Massachusetts trust us to handle their repairs and have come to expect 100% customer satisfaction. As local experts in garage maintenance and repair, we understand how vital your springs are to the efficient operation of your door and have all the skills, tools and qualifications required to deliver outstanding goods and services - with extraordinary customer service. When it comes to door springs, there are two different kinds: extension springs and torsion springs. For your local garage door repair, upgrade or maintenance, we are your one stop shop. We provide assistance with repair or replacement of most major makes and models of springs and will be sure to complete your repair quickly and professionally. Extension springs are the type that you usually locate on the door tracks. They get their name due to their method which is to extend in order to close the garage, and contract in order to open it. The tracks’ location differs from door to door, as does that of the springs. These are tricky to fit, and it is recommended that a qualified technician, with specialized tools, handle them. 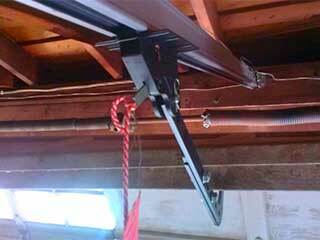 Torsion springs are located on a rod which is above the opening of your garage. When these springs are installed, they are wound up very tightly, which means that they are charged with a lot of potential energy. Due to this constant pressure, these springs tend to be damaged most often. Attempting to handle repair or replacement of these springs is extremely dangerous, even in the hands of a skilled technician with the right tools, so please do not attempt to tinker with them on your own. Speak to one of our techs about your garage door repair today!